We are your preeminent source for Texas Coworking. Coworking is a style of work that involves a shared working environment, often an office, and independent activity. It is attractive to work-at-home professionals, independent contractors, or people who travel frequently. Coworking is also the social gathering of a group of people who are still working independently, but who share values, and who are interested in the synergy that can happen from working with people who value working in the same place alongside each other. Coworking offers solutions to the problem of isolation that many freelancers experience while working at home, while at the same time letting them escape the distractions of home. Coworking is not only about the physical place, but about establishing the coworking community. 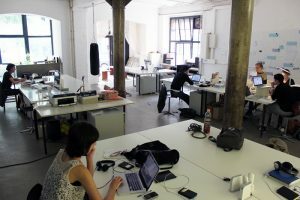 Coworking environments are open to events for attracting target groups (i.e. information technology, artists and startup businesses). A lot of Coworking communities are formed by organizing casual coworking events (e.g. “Jellies”) that can take place in private living rooms or in public places such as suitable cafes, galleries or multi-functional places. During these events Coworkers can experience the benefits of Co-working and get to know each other which lowers the barriers to join a place later. Sign up, follow and please share this site as we add more articles, sites and interviews on our Texas Coworking website in the days and weeks to follow.